According to new studies, Phobos is going to collide with Mars at some point, even if it takes a few tens-of-millions-of-years. This is due to the fact that Phobos is being drawn into Mars by its gravitational pull on the space rock, moving it closer and closer each year; however new research has uncovered some data that suggests, it may be a lot sooner than first predicted. This crushing blow into the Red Planet will shatter the small moon leaving behind a ring of rocks and debris to swirl around Mars. But the gravitational pull is not the only factor affecting Phobos, it’s apparently showing signs of “stretch marks” that increase its chances of breaking apart. One theory suggested that an object hit Phobos and nearly tore it to pieces; however it doesn’t appear like these grooves were created by an impact, but rather radiate from another area. One theory states that debris flying off of Mars may be impacting Phobos to create these visible grooves in its surface. But the tremendous pulling back-and-forth between Mars and its moon could also produce these stress fractures — this theory was proposed when Viking spacecraft first transmitted the images of Phobos — but at this time researchers thought Phobos was a solid mass, which would make stress marks less likely to occur. Today, scientists believe this moon may actually be held together by loosely piled rubble and about 330 feet (100 meters) of regolith (dust). In addition, some of these marks are younger than others which implies it is happening on an ongoing basis. If these premises prove to be real, it certainly could be the effects of gravitational pull or impacts on the small moon. 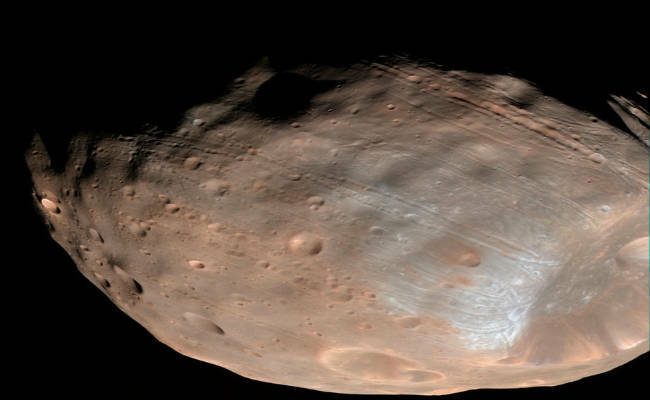 Phobos is estimated to be only about 14 miles in diameter (22 kilometers) and orbits Mars, rising and setting twice-a-day. Dramatically affected by the tidal stresses from Mars — Earth feels the gravitational pull of the moon which causes the tides to rise and fall, even though the moon has no oceans, Earth’s gravitational pull is still called tidal forces — Phobo like our moon also experiences these tidal stresses. After running comparison stresses here on Earth, the two determined that Phobos will most likely break apart to form a debris ring around Mars over the course of 20 to 40 million years. What Might This Ring Around Mars Look Like? Because of Phobos make up of mostly dark material, this debris will not reflect light all that well, so the ring may be difficult to spot using an amatuer telescope, but it has been suggested that the ring’s shadow could very well be visible. Name a star now! - Rings Around Mars? Maybe Someday!